Bonifacio Global City is one of my favorite places to go to in Metro Manila. I like how organized the roads are, how there are bus stops and parks, and how walkable the sidewalks are. There’s so much to love about BGC that I’ll take up the entire article just listing them down. The benefit of a planned city is that you can control its growth. As a result of careful planning and development, BGC has become a thriving financial and cultural district, with gleaming skyscrapers, classy condominiums and hotels, outdoor dining and shopping, public art, performing arts centers, and even a world-class science museum. BGC is a walkable city and it’s fun to explore it on foot. Public art is everywhere, and can be found in surprising places. 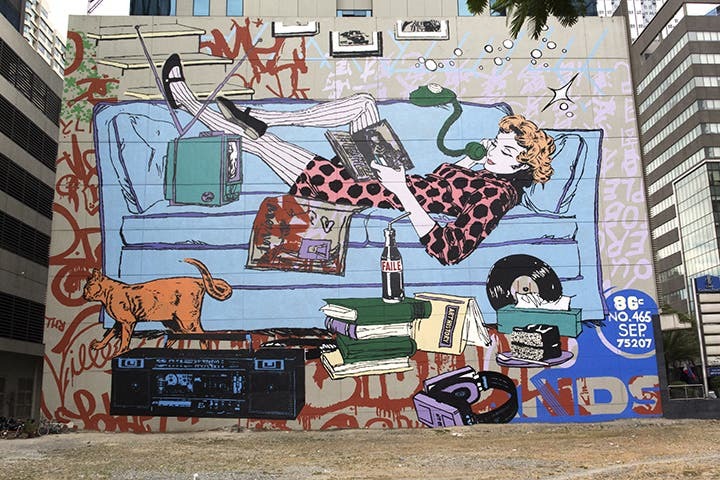 The murals that scatter the city are developed by the Bonifacio Arts Foundation (BAFI), which holds the ArtBGC NextAct ONE Festival each year to commission artworks. Some of the murals painted this year are The Heart Of God’s Country (by Andrew Schoultz at W Fifth building, overlooking 5th Avenue and 32nd Street), Wonderland (by Faile at One Global Place, 26th Street corner 5th Avenue), and Calamansi and Sampaguita (by Francisco Diaz at BGC Corporate Center). Guided tours can be arranged at the Alveo Showroom in Bonifacio High Street (BHS), with daily tours at 5:30pm. The country’s first 4DX cinema can be found in BHS Cinemas, and it can definitely level up your viewing experience. 4D viewing means you can experience whatever is happening onscreen, through seat movement, mist, light rain, smoke, fog, and lightning. It’s best watched with an action movie, where you can experience what it’s like to be a super/hero. I watched The Amazing Spider-Man 2 here and I felt like I was swinging in the sky with Andrew Garfield. If you’d like to watch a movie without the special effects, you can opt to watch in the three other theaters, which are equipped with the Dolby Atmos surround sound technology. One theater also has reclining seats for maximum comfort. Seda Hotel in BGC is the perfect place to check in if you want to spend a few days in the city, as it is conveniently located next to BHS, Serendra, and Market! Market! If you’re a design junkie like myself, you’ll like the hotel’s neutral colors and minimalist yet classic feel. Philippine design is proudly showcased here, with pieces by Kenneth Cobonpue, Ann Pamintuan, Tom Epperson, and Jaime Zobel de Ayala. The rooms are also luxurious, with a large bed, a wide-screen LED TV, executive desk, and media panel with a universal adaptor and USB / AV connectivity. My favorite part of the room is the long alcove below the window, which gives you supreme views of Serendra or the BGC skyline. Those who would like to upgrade their stay can book the club room or the suite, which has express check-in and check-out, all-day coffee, tea, and non-alcoholic beverages, complimentary breakfast, afternoon refreshments, and cocktails. Foodies can enjoy the “al fresco” seating at Misto Restaurant, and the roofdeck bar Straight Up for unparalleled views of the city skyline. The Mind Museum is a world-class museum dedicated to teaching science. The two-floor museum is divided into five galleries: atom, life, earth, universe and technology, which have interactive exhibits done by Filipino designers, scientists, and fabricators. There’s even a life-sized T-rex exhibit! The Mind Museum has a traveling exhibition called the Science Circus, where guests can enjoy exhibits set up like a circus. There’s the Electric Spiral, a carousel that converts energy ino electricity; the Perception Room, which can alter your sense of reality; the Floating Head, an optical illusion that makes you look like disembodied; the Monsieur Conjurer, another illusion that makes things disappear and reappear in pictures; and many more. The experience of shopping outdoors is unique to Bonifacio High Street, and it is home to many local and global brands. The benefit of shopping here is that many labels have flagship stores with many levels, which means more items to choose from. Whether you like food, gadgets, clothing, or adventure gear, there’s a store in BHS for you. Uniqlo just opened its three-story shop here, and it’s one of their biggest stores, carrying all of its collections. This December, Mastercard will give you the ultimate BGC Experience with rewards from BHS, Seda Hotel, The Mind Museum, and other BGC malls for Mastercard cardholders. From November 15 to December 31, shop with using your MasterCard and be one of five winners of a P10,000 shopping spree at BHS; an overnight stay at Seda Hotel; two free tickets to the Mind Museum; and two tickets to BHS Cinemas. Earn one raffle coupon for every P3,000 (single or accumulated receipt) at any BHS, Bonifacio Stopover, Crossroads, One and Two Parkade, The Fort, or Park Triangle establishment. From November 11 to December 30, Mastercard will also give a free ticket to the Mind Museum for every three paid admissions to the museum or any of its special exhibitions. If the tickets are of varying prices, the ticket with the lowest price will be considered free. From December 15 to February 28, 2017, avail of 50% discount on published room rates on Fridays, Saturdays, and Sundays at Seda Hotel. Straight Up Bar also offers a special 15% off on a la carte food and drinks from Sundays to Thursdays. Seda also offers social celebration packages at 15% off on weekends and 10% on weekdays. Baked Christmas goodies will also be available for 15% off. On December 13, the Filipinas Chamber Orchestra conducted by the world-renowned Italian maestro Ruggero Barbieri will perform at Straight Up. Mastercard card holders can enjoy 15% off the ticket rate, inclusive of cocktails and a six-course dinner under the stars. From January 1 to 31, 2017, earn one ticket to BHS Cinemas for every single-receipt purchase of P5,000 at BHS.